Stantec Treatment in the UK had quite a large visitor come by their Ince Waste to Energy site in the shape of an enormous 750 tonne crawler crane. Just to put that weight in perspective, it is heavier than six Blue Whales! The crane was brought in to help with some particularly heavy and difficult lifts as part of the ongoing construction project on site. There are tall cranes and then there is the one the Ince team brought in; it was truly a sight to behold with almost 100 metres of jib reaching for the sky. The crane arrived on 30 low loaders and took seven days to rig it ready for use. It was used to lift off an 18 tonne roof panel and then move several heavy structures through the roof opening into the building. Once assembled and rigged, the crane stood 10 meters higher than the 85 metre high chimney stack! 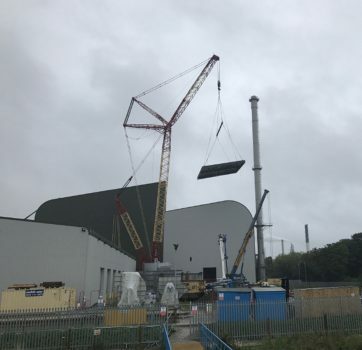 The lifts into the building included three boiler modules (the heaviest of which was 140 tonnes), a 48 tonne steel access platform and a 37 tonne outlet duct. The latter two were put together outside of the building to save programme time and the need for scaffolding inside the structure. 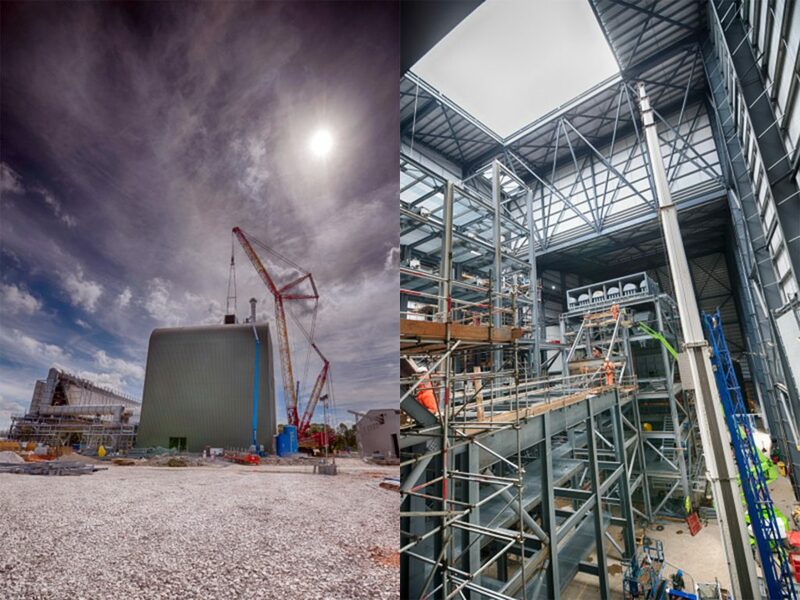 A 500 tonne mobile crane moved the structures within distance of the crawler crane and then they were lifted inside of the building through the removed roof opening. It was a long, difficult process but the team did a fantastic job even with some overly windy weather delaying parts of the lift. 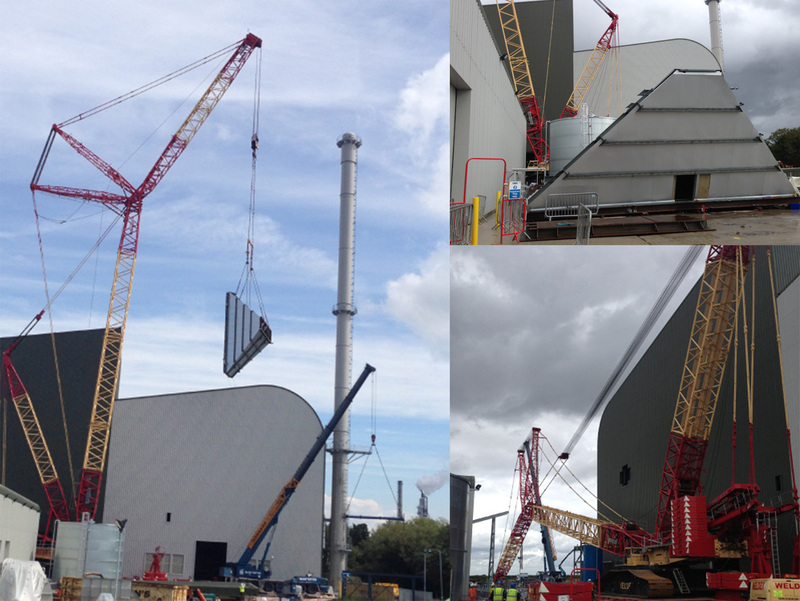 The 140 Tonne boiler module move was a big test for the team. They top-and-tailed the module from the horizontal to the vertical using a 300 tonne tailing crane and the 750 tonne crawler crane. It was a tense moment as this was the first time the boiler had been in a vertical position. They then removed the temporary yellow painted shipping beams and lifted it 70 metres into the air through the roof opening and onto the prepared steelworks. The lifts have gone extremely well and the preparation and organisation in handling a crane of this size is a testament to the team at the Ince site. There is unlikely to be anything as gigantic as that welcomed onto the site any time soon!